Enables children to work and write at the optimum angle, encouraging good handwriting practice. 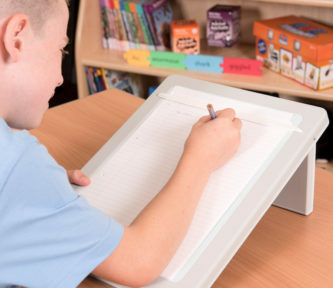 Some children hunch over the desk when writing on a flat surface, which can sometimes lead to the development of an incorrect posture and poor motor control. The writing slope prevents children from bending over their desk, and maintains the optimal writing posture, which prevents strain on neck, shoulders and back. The closer proximity of the writing material to the eyes allows for easier reading and prevents uneeded strain on the eyes. Purposefully made with a slippery surface to ensure children use both hands - one to hold the paper in place, the other to write. Each sturdy slope is set at the recommended angle of 20 degrees and has a rubber grip to prevent slipping. The writing slope is tough, durable and can be carried easily from classroom to classroom. The simple design requires no assembly and is easy to stack and store. Light and easy to use. Improves handwriting. Good product but slippery when placed on the table. Could do with a grip sheet on it as the paper slips off. Amazing and is his favourite colour. Sturdy, good size have bought several. Maybe our fault! - we now realise that the child needs more stability i.e. something to stop the slope from slipping away from her. The product we received was as described and is of very good quality - perhaps having some way to clip the front of it securely to the desk is the next step? Does what is supposed to do and arrived quickly.